Research by Forbes and DigiMark Partners identifies the key trend for 2017 in Business to Business (B2B) marketing as being “Customer Experience Balance”. By this they mean businesses should “Strive to use a balanced approach to building customer loyalty.” They helpfully explain that it is no longer about deploying “customer centric” methods, but rather a “customer focussed” methodology. Now that sure sounds cool and fancy, but what does that mean in real life? One of the key aspects of a customer focussed strategy, is that it is centred around what your customers value most, and consistently delivering this across all touch points that a customer has with you. An easy way to explain what this is like is by looking at the “Disney Experience” that is delivered when you visit the House of Mouse (i.e. Disneyland/World). There, the Disney experience is defined to within an inch of its life; streets should be clean, colours bright, everything has to look spotless and in good repair, customer services should be second to none, and all staff should smile, look impeccable and behave exemplary. Disney go to sometimes frightening lengths to ensure this and we have all heard of the “Disney Bible” that staff are drilled on and expected to follow to the letter. The end result of this however, is that their customers are always and consistently exposed to the correct “Disney Experience”; customers have certain expectations when dealing with Disney and the company goes to great lengths to ensure that these are met. A very obvious example of a customer focussed methodology. But what does that mean within a B2B context? How do we achieve this when not running a theme park? It starts with looking at the main thing that your customers value. Let’s say that the main thing you are known for is the quality of your product, which is why customer keep returning to you. Applying a customer focussed methodology to your marketing in this context means that at every opportunity the customer should be remined of this quality, as this reinforces their opinion of you as a quality product providers and re-affirms their confidence, enhancing their customer loyalty. So practically, this means that you should examine your touch points and ensure that your key value of quality is obvious and present. For instance, is your website up to scratch? An obviously out-dated website or corporate video hardly screams “quality”. Perhaps you have a fleet of corporate vehicles. Are they clean and in good repair or do they look tatty? Are your offices or plant well looked after? Do your exhibition stand or brochures reflect you as a company with quality as the key driver? How do your personnel interact with your customers? Do they convey the key value of quality you are trying to get across? (Likewise if the key value that your customers associate with you is cost-effectiveness, it might not be the best idea to rock up for a meeting in a Rolls Royce). Considering all of these touch points and ensuring that they all reinforce the key value that you are trying to get across breeds customer confidence and loyalty and ensures that all the marketing money you spend on getting them in in the first place isn’t wasted. 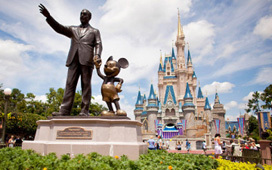 And all of this doesn’t necessarily mean that we need to go all Disney on our staff, but rather ensuring that everybody in the company understands the corporate culture and values, is on board with them and portrays them to your customers at all times.